I’m a nurse so trained in western medicine ways…After years of migraine headaches I was searching for an alternative treatment that wouldn’t involve synthetic chemicals. Seizure meds wouldn’t mask the pain and put me to sleep in a dark quiet room…Anyone who has migraines knows how debilitating and painful they are. I stumble upon a rolfing pamphlet at my hospital library and thought it could be interesting. I gave it to my mother who also had terrible posture and headaches. She called Mary and started the 10 series. I decided to wait it out and see how it worked for her before I spent the money myself! Mom finished and a month later realized one day that she couldn’t remember the last time she had a headache!! Her posture was much improved. In fact people commented how young she looked. (I think poor posture ages your appearance). I took the plunge and stopped all medications and met Mary. She is one of the sweetest, non-judgmental people I know. As nervous as I was to stand in front of her in my undies, I felt I could look like the hunchback of Notre Dame and feel safe. I was having 2-5 migraines per week when I first started. After the 5th session I noticed a drop in frequency- you must stick with it since the body needs time to move years of bad muscle memory. Sure enough a month or two after my 10th session I also noticed drastic improvements. I had maybe 1-2 per month versus an average of 12 per month. I felt like a different person! I was not trying to function through pain, I was simply not HAVING PAIN!Was it worth it? Yes! Every penny! Would I do it again? In a heartbeat! Go see Mary- I promise you’ll be glad you did! “Mary Phillips helped me to start feeling again…..Literally. I started going to Mary to treat my Thoracic Outlet Syndrome in 2006. My entire body went completely numb from the neck down & I was pretty desperate for help when someone recommended Rolfing. My “conventional” doctor openly ridiculed me for this decision. He said that I’d need to have surgery on both of my arms & then maybe after 6-8 months of physical therapy I might regain a little feeling in my arms. Mary not only helped me regain 100% of the feeling in my entire body, she also eradicated the intense asthma-like breathing difficulties that were a result of the numbness. This all happened in only 3 months. 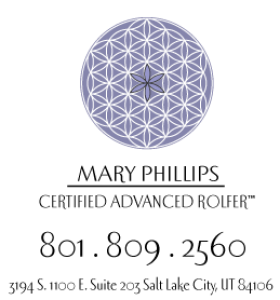 The money I spent on Rolfing with Mary was a fraction of what I would have spent on surgery & the effects last for years, not weeks like I was used to expecting from a chiropractor. She’s helped me with numbness, breathing (in both my lung capacity & my sinuses), foot pain, posture, lower back pain & neck spasms. I’d also dare say that working with Mary has brought me a kind of inner peace through physical healing that I could not have found elsewhere. I would highly recommend Mary to anyone looking to achieve long-term wellness. It is so very worth it.